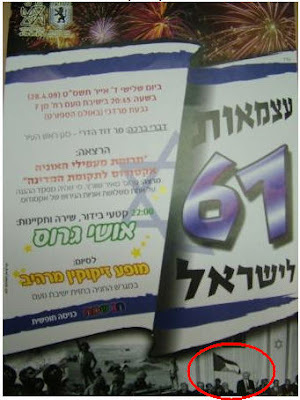 Yesterday, Israel Independence Day, Yom Haatzmaut, marked Israel's 61rst birthday. In addition to a day of fire works (the evening before), special prayers, introspection, appreciation, and mandatory barbecue, we also watched the televised International Bible Competition from 11 AM to 1 PM. Yes, it doesn't sound amazing or overly fascinating, but from year to year I find the competition magnetizing. The participants have an extraordinary grasp of Bible/Tanach and it never ceases to amaze me how much information the participants store and retrieve on a moment's notice. Yesterday's competition did not disappoint. Hosted by Dr. Avshalom Kor, one of Israel's primary linguists and interesting personalities, his sharp wit helped make a potentially boring subject come alive. 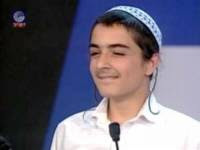 The final round of the competition was between two extremely talented young men, Sapir Malka, from the settlement community of Kochav Yaakov, student from "Yashlatz" -- the Yeshiva l'Tzi'irim -- Merkaz Harav High School" (where a terrible terror attack took place a year and a few months ago) and Uri Lubish, from the settlement community of Yatir, student at the Susiya Yeshiva High School in the Southern Hevron Hills. They were neck and neck, with Sapir leading by a single point. And then the 12 random question final round started. 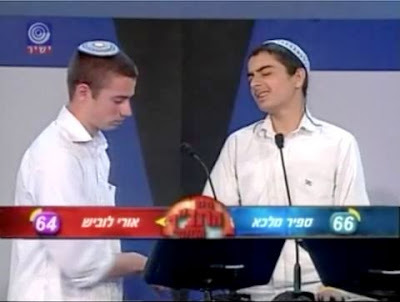 5 seconds per question, and the most random of questions from end to end of the Tanach, were posed back and forth between the 2 challengers. Neither Sapir nor Uri paused for more than the slightest of hesitations between the questions and their answers. And then, a question was posed to Uri which caused him to hesitate. He paused, and then said he didn't know. He didn't guess, he truthfully didn't recall. This clinched Sapir as the winner. Yet instead of smiling or grinning in the knowledge that he was now the First place champion of the International Bible Championship, he grimaced in pain. His visible sadness said it all -- as his friend and competitor Uri missed the question, pushing him down to the runner up-spot, instead of the possibility of them sharing the title together. 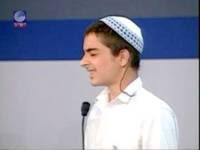 Not only did Sapir win the championship based on amazing knowledge of the Tanach, but he is truly the champion by his exemplary character of seeing the competition as a collaboration. As Prime Minister Netanyahu said in his closing remarks of the championship, "All of the participants...just by getting here, are winners..."
Avshalom Kor summed up the event, "This is the last year of the International Bible Championship, because B'Ezrat Hashem, with G-d's help, next year, all Jews will be living in Israel, and there will only be a "national" competition." Survey among Israelies: Israel more popular than ever! "The survey found that 80% of the Jews polled defined their personal status as "very good" or "good," 90% said they think Israel is doing "very well" as a nation; and 81% said they were "very optimistic" or "optimistic" as to the nation's future. Some 81% also said that given their choice of countries to live in, they would prefer to stay in Israel. " ...Independence Day is an opportunity; an opportunity to admit that something beautiful is being done here. That something touching has been built here. That we only become better with the passage of time. We have an ultra-Orthodox deputy health minister, a religious science minister, and a secular Knesset speaker, who holds his first tour in an Arab town. We have camaraderie here and people help each other during times of crisis, we have a special culture and diversity of opinion, and we have quite a bit of love and spirituality around here, hiding behind the veneer of our hurried routine. We have plenty of time during the year to look into what is still missing. Independence Day is the opportunity to admit that we already achieved most of it. Lab results have just returned positively identifying Tomer Vagim in the Netanya Laniado hospital -- as being infected with the Swine Flu. The Ministry of Health announced the results moments ago, and he is reported to be in good condition, and is in medical quarantine / hospital isolation. 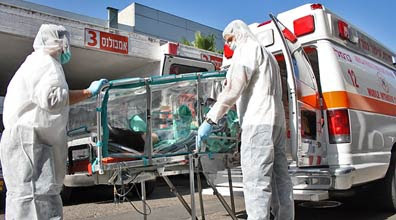 An additional person is hospitalized in the Meir Hospital in Kfar Saba, but his test results have not yet returned to positively identify the origin of his condition. More on this as it gets published. Link in Hebrew for ynet article, here. 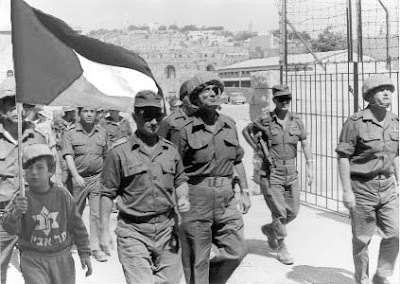 Israel's Memorial Day (Yom HaZikaron) is a day which is tangibly felt unlike every other day on the calendar. The seriousness of the day is almost overwhelming as we remember the dedication and sacrifice of those who fought for Israel's existence, as well as those who were killed by Arab terror attacks for simply being in Israel. Every fallen soldier or terror victim is a world of sacrifice and pain to their family and friends, and there isn't a person in Israel who doesn't personally know of someone affected. They walk among us daily within their world of personal, quiet pain, having sacrificed the most painful of all so that a Jewish State can exist today. A friend of mine, Cheryl Mandel recollected about her son, Daniel Mandel who was killed in the line of duty. The video is below, and the story is here. I'll post more links throughout the day within this post. Check back later. An Israeli Soldier's Mother on Memorial Day. Harriet Levin didn't think she would "give so much" to Israel. 1:59 PM For those that read Hebrew (I don't have time to translate this), the following article is a must read -- last night's memorial ceremony at Binyanei HaUma...and the song "Vhee Sh'amda" was sung by Yonatan Razel, students from Merkaz HaRav, and IDF Officer Aharon Karov who was critically wounded in the "Cast Lead" operation. Karov stated, Above all our disagreements, we are brothers. Our enemies do not discern between the rightwing or leftwing. They believe we are one nation, which we are. This is the song performed by Razel before Pesach. The "Young Rabbi" blogger alerted me to the following (as did many others, MC, etc. )....now reported in the Jerusalem Post. "A serious mishap occurred in the preparation of the Independence Day announcement, which was prepared by an external provider, as a result of the infiltration by malevolent sources into the Internet photo archives," the community center said in a statement. "We are stunned, hurt, and apologize for the grief caused to us all." The municipality called the incident "very severe." Palestinian and Arab fauxtography is nothing new. In their ongoing FieldSec (Field Security) battle against cell phones, the IDF has declared war...on Apple's iPhone. NRG/Maariv reports: [translated from the Hebrew] After the Second Lebanon war, the Israeli Navy's commander, General Eli Marom forbade Naval soldiers from bringing cellphones with built-in cameras onto bases and ships -- since photos of the bombed INS Hanit appeared on the internet. Going one step further, the Israeli Air Force has now placed a strict ban on Apple's iPhone -- no soldier can bring an iPhone onto any IAF Airbase whatsoever. "We saved up money for a long time [for the iPhone]as it costs several thousand Shekels -- and now we need to sell them at a loss. Every phone today already has internet connectivity and a built in phone. Our officers suffer from paranoia that the whole world is listening to them. This is just an attempt to annoy us...the IDF is in "trauma". The IDF goes to great lengths to protect field security and data integrity. In order to prevent information leaks, iPhone and similar phones are prohibited from IAF airbases unless permission is granted by the FieldSec Officer to only allow access of the phone to non sensitive areas. Who sank the Iranian Weapon Ship? The following was reported by the Nana news service in Israel (in Hebrew)...and appears here as well in English. Bethlehem – Ma’an – An Iranian ship transporting arms to the Gaza Strip was destroyed off the Sundanese coast in the Red Sea last week, the Egyptian newspaper Al-Usbu (The Week) reported on Sunday. The newspaper reported that an unidentified warship launched missiles at the ship, sinking it with its crew and cargo. Quoting anonymous sources, the newspaper suspected Israeli or American forces were responsible for the attack. The same sources said the ship was on course to dock in Sudan, where the weapons would be unloaded and eventually shipped to Gaza through Egypt. Neither Iran, Israel, nor the United States have made any official comment on the report. In March it was revealed in American media that warplanes, likely Israeli, bombed a convoy of trucks suspected of transporting weapons to Gaza in January. Israel did not deny that it participated in the attack. Since this email flew around the web so quickly and attracted a lot of attention today in Israel -- in a rare move, the Bank of Israel/Ministry of Finance made an official announcement that there would be no tax on the internet. Due to the wave of rumors flooding the internet, the Treasury and tax authority hereby announce conclusively that there is no intention, nor was there any intention to levy any sort of tax whatsoever on internet services. לגל שמועות המופץ ברשת האינטרנט, מודיעים במשרד האוצר ורשות המסים באופן חד משמעי כי אין ולא היתה כל כוונה לגבות מס כלשהוא על שירותי אינטרנט מכל סוג שהוא", נמסר מהאוצר. Its funny how Israel's rumor mill follows the US almost to a carbon copy. The joker who sent out the email was inspired by the infamous internet tax bill from the United States (which was also a hoax) -- and claimed the US congress was planning on implementing a 5 cent surcharge per email. It was so serious 9 years ago, that the US House of Representatives even passed a law, prohibiting the FCC from attempting to "set and impose fees on the internet." By a voice vote, the U.S. House of Representatives today approved H.R. 1291, the Internet Access Charge Prohibition Act of 1999. The bill blocks the Federal Communications Commission from attempting to set and impose fees for accessing the Internet and should end forever the infamous myth of bill 602P and Congressman Tony Schnell. 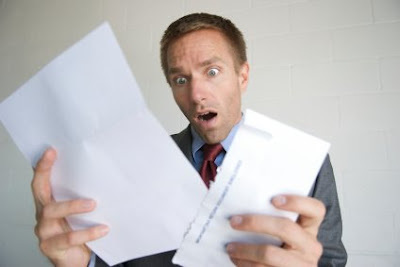 The bill comes partially in response to a bogus email message circulated for at least a year warning Internet users of a fictitious bill "602P" by a fictitious Congressman named Tony Schnell creating a monthly surcharge on Internet access. Our friend The Rebbetzin's Husband has put together another outstanding issue of one of the longest running blog carnivals around. It is called Haveil Havalim #214 - The Radiant Ziv edition. Go check it out, you'll glad that you did. For visitors seeking information about IDF Homefront preparedness, please go down a few posts, or click here. The Muqata blog will go to no ends to brand itself...the following rare spider was found in Hawaii. This tiny spider, which measures just a few millimetres across, has developed bizarre markings which look just like a smiling face. 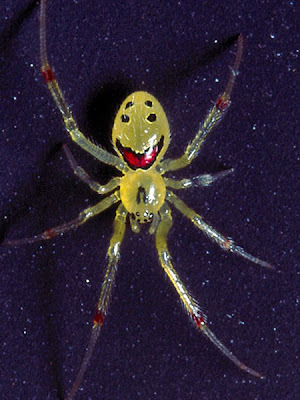 The so-called happy-face spider, which is harmless to humans, has evolved to confuse predators, scientists think. The rare species is found in rainforests of Hawaii. This report from the World Tribune isn't surprising, but it is a somber wake-up call for what Israel can expect during the current administration. Normally, I wouldn't post the entire text, but its crucial that Israel's supporters see what Obama's administration has in store for us. IDF Homefront: You're on the Map! Greeted by cheerful dolphins, scuba divers, ski bums, and a large Azrieli Shopping Center located in the center of geographic Israel (in the Shomron instead of Tel Aviv) -- the IDF Homefront Command is trying its best to take a very scary concept and make it palatable to all: All of Israel is now in rocket range from any of our numerous enemies. This map gives you a very accurate indicator of the minimum amount of time you need to find serious shelter in case of an missile detection Air Raid siren going off. Different people cope with emergency situations in a variety of ways, but my personal recommendation has always been: preparedness is the best way to deal with an emergency. That's why we built a bomb shelter in our home, despite it not being mandatory from a zoning perspective (though 2 years after we built our home, it did become mandatory). All our cellphones (and our kids phones) have the emergency IDF dispatcher hotline programmed to a speed dial and we know who to call for emergencies, and how to act in case of different situations -- earthquakes, sirens, etc. Just this past weekend, I showed our kids how to put on gas-masks (currently, the IDF only plans on redistributing them within 2 years), and I'd rather kids be aware of them now -- then only seeing them for the first time during an emergency. The IDF Homefront says their new program of missile/emergency preparations and awareness does not mean a war is imminent, so I'll let you draw your own conclusions. In the meantime, for residents of Israel, I seriously advise taking some time to read through the IDF Homefront website in English, Hebrew, Russian, and even in Arabic. The Arabic is mildly disturbing, considering the fun graphics of missile launches, Qassam rockets and fires with Arabic captions look slightly more like something from a Hamas website. OK people - you know what to do. Be prepared, discuss it with your kids, and don't bury your head in the sand. Missile threats are reality -- and the best way to prepare is to take the outlined, necessary steps from the IDF Homefront command. And make sure your bomb shelter/MAMAD has an internet connection in it, so you can see real-time updates from the Muqata blog. Cars come to a halt, as Sirens Wail throughout the country. 10:02 AM The air raid sirens around Israel just tapered off. Israel, the country stood silently for 2 minutes to the backdrop of memorial air raid sirens to remember the victims of the Holocaust. Just months ago the sirens blared daily throughout Southern and South-Central Israel as Palestinian rockets were routinely shot at Israeli communities. The 2 minute siren wail is a good time to consciously reflect on remembrance for those slaughtered by the Nazis, their supporters and sympathizers. As I glanced out the window, buses and cars pulled over to stop. People got out of their cars and stood silently. 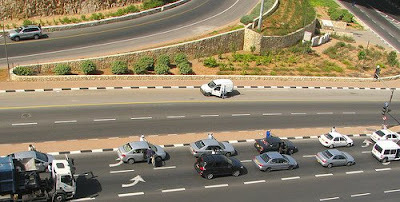 Even on main highways in Tel-Aviv, people stopped. What could be more fitting than for the Durban II conference against Anti-racism to be opened hours before Israel commemorates "Yom HaShoah" -- Holocaust Memorial Day. Iranian President Mahmoud Ahmadinejad, who has previously denied the Holocaust's existence was the keynote speaker and did not disappoint. Unfortunately, Ahmadinejad isn't the only Arab leader to deny the Holocaust's existence. USA President Obama's primary Palestinian partner (and president of the Palestinian Authority) Mahmoud Abbas wrote his doctoral dissertation specifically denying the Holocaust. Arab sympathy for the Nazis, and hatred for Jews is nothing new. Way before 1967 when Israel "captured" the West Bank, long before Israel was a State, the Nazis and Arabs collaborated together to kill Jews. Husseini became a supporter of the Nazi "final solution" to the "Jewish question" in the early days of Hitler's regime. In 1939, when his Nazi sympathies came to the attention of the British, he fled to Berlin where Adolf Hitler personally welcomed him. The Nazi's lodged Husseini comfortably, for the duration of the war, in a confiscated Hebrew School and set him up as Prime Minister in exile of a pro-Nazi pan-Arab government. His foreign minister in exile was Iraqi exile Rashid Ali al-Kilani and his war minister Fawsi al-Kaukji. The Nazi Foreign Ministry paid him $10,000 per month and Himmlers SS transferred portions of the "sonderfund," funds confiscated from Jews, for his use in setting up pro-Nazi and anti-Jewish activities in the Arab world. For the United States to pressure Israel into negotiating with the Palestinians, led by a published and self-proclaimed Holocaust denier is simply abhorrent. To offer Israel security from Iran at the expense of expelling Jews from the Yizhar settlement, ("Buscher for Yitzhar") and converting parts of the historic land of Israel to be Jew-free, Judenrein is the ultimate insult. President Obama has missed the point completely. 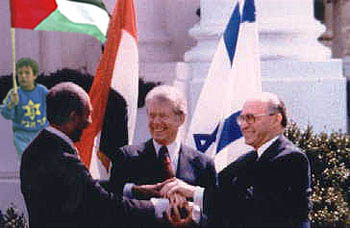 Walking out on Durban II to object over Ahmadinejad is meaningless -- when pressuring Israel to accept a "2 state solution", one being a Palestinian State, ethnically cleansed of Jews. I opened up my email and read "...our exclusive stainless-steel waffler creates the best we’ve ever tasted." It was tied into an ad for this waffle maker and I instantly thought of Jameel. Not to mention that now that Pesach has come and gone it is time for a waffle breakfast and maybe a tiyul or two. That's it. Pesach is finished. Tonight, the night after Pesach marks "Rumplenacht" the night in which all pesach related pots, pans, and cooking/seder/passover related stuff gets put away for next year, and the chametz stuff comes back out after 7 days of non-use. I think this year was the fastest of all, and we accomplished the switchover in about 1.5 hours. 1. My favorite, yet perhaps the least accurate: Rumple comes from rumpling of newspaper which goes around the pesach dishes in preparation for storage for the coming year. 2. Our neighbor who speaks dozens of languages translated "rumple" into Hebrew as "balagan" -- a chaotic mess, since the switchover from pesach to chametz is usually rather chaotic. 3. I heard this tonight: Rumpelstiltskin slept for a long time, so maybe the pesach dishes now sleep for a year as well? Mimouna (Hebrew: מימונה‎ Arabic: ميمونة‎) is a traditional North African Jewish celebration held the day after Passover. It marks the start of spring and the return to eating chametz, i.e., leavened bread and bread by-products, which are forbidden throughout the week of Passover. Some believe the source of the name is Maimon, the father of the Rambam, Rabbi Moshe Ben Maimon, and the Mimouna marks the date of his birth or death. In Israel, the Mimouna has become a popular annual happening featuring outdoor parties, picnics and BBQs. After settling in Israel, Jewish immigrants from North Africa celebrated the Mimouna with their families. In 1966, it was introduced as a national holiday, and has been adopted by other ethnic groups, mainly in the Mizrahi sector. The celebration begins after nightfall on the last day of Passover. Moroccan and Algerian Jews throw open their homes to visitors, after setting out a lavish spread of traditional holiday cakes and sweetmeats. One of the holiday favorites is Mufleta. The table is also laid with various symbols of luck and fertility, with an emphasis on the number "5," such as 5 pieces of gold jewelry or 5 beans arranged on a leaf of pastry. Over the last few decades, the Mimouna has become a public relations tool for Israeli politicians, who use it as an opportunity to mingle with the masses and drum up public support. 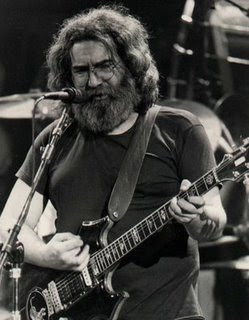 Who cares about an Obama seder when you can have Jerry Garcia. 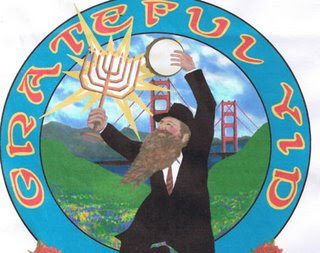 With Jameel on vacation, I just couldn't leave the blog unattended, especially after I heard rumors (by a DovBear commenter) that the Grateful Dead used to run a Seder on Pesach during intermissions backstage. 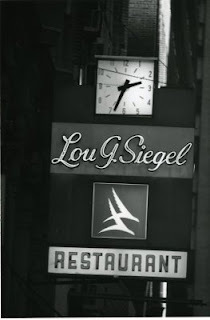 As Jerry was a veggie (and not Jewish), I wonder what they did about the shank bone and Matzah Ball soup (especially as it was catered by Lou G. Siegels - wasn't that place awesome). Anyway, I've been doing a lot of research on it, and so far I found out the following. First of all, there is an article about the rumors from 1996. Second, there are apparently Grateful Dead Kipas and Haggadot somewhere in the world, but I haven't been able to find any pictures. 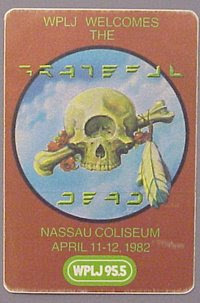 So readers, if you can find a picture of the Grateful Dead Haggada or Kipa, send us a link and I'll post it. Or better yet, send us the Haggadah or Kipa - that would be so cool. 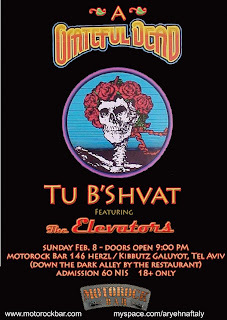 In the meantime I found other interesting things, like this Tel Aviv bikers bar that ran a Grateful Dead Tu B'shvat event. And then there is the Grateful Yid. So if anyone knows more, the more you tell over, the bigger the mitzvah. To be said tomorrow: The Sun Blessing - Birkat HaChama (only once every 28 years). Follow-up on the London Ghost, by a previous tenant. The Absolut Hagaddah 2009 edition. Worth downloading. What I'll be doing tomorrow: Extreme Matza, life on the edge. The latest armored ambulance for MDA is now being tested. Fed up IDF reservists demand investigation against Ha'aretz newspaper for slander. IDF reservists have asked Attorney-General Menahem Mazuz to launch a criminal investigation against Haaretz for publishing "testimonies" by soldiers of alleged misconduct and serious human rights violations during Operation Cast Lead in the Gaza Strip earlier this year. The "testimonies" were reported widely in the media. Last week, Judge Advocate General Brig.-Gen. Avichai Mandelblit exonerated the IDF and decided to close a Military Police investigation into the accounts, claiming that they were based on rumors. The letter, signed by 65 reservists who served in Operation Cast Lead, sent the letter to Mazuz on Monday and asked that he launch an investigation against Haaretz on charges of slander for reporting on the testimonies as if they were fact and not hearsay. 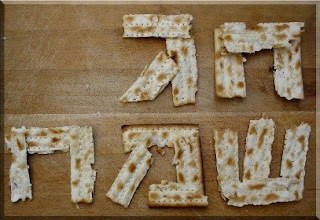 Got the following Happy Passover matza picture today from someone on Facebook. Wishing all the Muqata readers a happy, healthy and kosher passover. And may we merit eating the korban pesach at the Beit HaMikdash tomorrow. Exceptional Archeological Find at "Gilgal"
This news has been brewing the past few weeks, and was finally announced today. 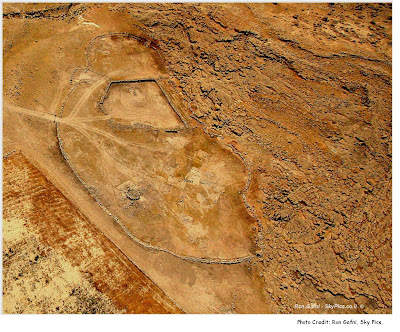 The footprint structures were found by Prof. Adam Zertal, noted biblical archaeologist who discovered Joshua's altar on Mount Eval near Shechem. Worth reading the entire article here. Haaretz picked up the story as well. Really. 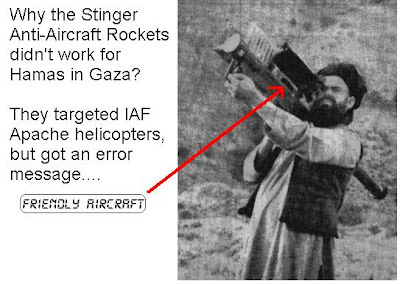 After Hamas successfully smuggled anti-aircraft Stinger missiles into Gaza, they were given the order by Hamas commanders to shoot down IAF Apache helicopters during the past IDF "Cast Lead" offensive. The US manufactured Stinger anti-aircraft rockets have built in sensors that prevent firing upon friendly aircraft...Apache helicopters included. 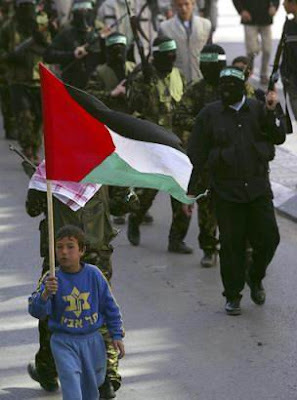 "We were disappointed by them, and they were found to have been useless," a Hamas source said. Industry sources said Raytheon, producer of Stinger, installed identification friend/foe capabilities more than a decade ago. The sources said this would prevent Stinger from being fired against any aircraft used by the U.S. military. Another Hamas source said gunners deployed Stinger along with heavy machine guns in attacks on Israeli helicopters during the war in the Gaza Strip. The source said one Stinger surface-to-air missile was launched, but the projectile veered off course and struck a Hamas gunner squad. 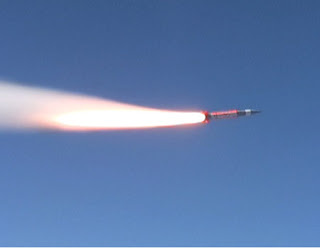 "The Stinger was drawn by the heat of our guns rather than the engines of the Israeli helicopters," the source said. "At that point, we stopped using this weapon." Since the ultra high tech weapons failed to work for Hamas, they have resulted to tried and true weapons which never fail...the pre-Passover blood libel. "Jews drink the blood of Muslims and believe that God wants Jews to hate Muslims, according to a Hamas TV skit. Performed before a live audience at the Islamic University in Gaza, the segment features actors playing a father and son, in traditional Hasidic Jewish garb, discussing their God mandated hatred of Muslims. The skit opens as the father instructs: "We Jews hate the Muslims, we want to kill the Muslims, we Jews want to drink the blood of Muslims." It is later explained that Jews wash their hands before prayer, not with water, but with Muslims' blood: "We have to wash our hands with the blood of Muslims." Blood libels were a tragic part of Jewish history, as Jews were accused of using the blood of non-Jews for ritual purposes, especially the baking of Matzah for Passover. Blood libels created deep hatred and were an effective trigger for numerous pogroms and the murder of thousands. The Hamas accusation that Jews drink Muslim blood comes the week before Passover, the anniversary of many horrific blood libels." Sourced from the Jewish Issues Watchdog. Hat-tip: My favorite Stats professor. For more, see how the four sons developed their unique personalities at Aish. Unless of course, you can come up with a better name for this movie. 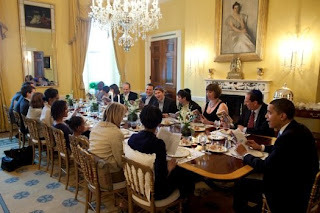 Personally, who wants to see robots have a seder. I'd much rather they clean the house. I am pleased to let you know that Haveil Havalim #211: The Preparing for Pesach Edition is up at Ima on (and off) the bima. 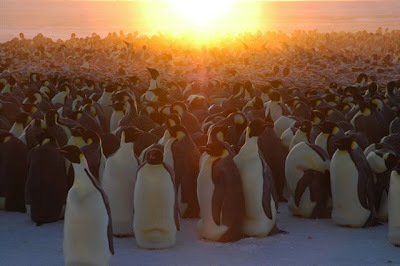 Haveil Havalim is the weekly blog carnival of the Jewish/Israeli blogosphere. It serves as an excellent resource that you can use to find out what has been happening within the J-blogosphere during the past week. A list of past and future hosts can be found here. 4:20 PM Photo posted of Shlomo Nativ. Funeral scheduled for 5 PM at Bat Ayin, Gush Etzion. 3:11 PM Name released of victim of axe attack today, 14 year old Shlomo Nativ. 2:27 PM Reports that the IDF is surrounding a house in the village of Tzurif where the terrorist may be hiding. 2:23 PM IDF reports that the axe terrorist entered the Bat Ayin community by dressing up as a "settler"
2:07 PM Conflicting reports if a location of a fallen rocket was found. The Municipal Hotline operator from a northern community stated it landed in the Even Menachem area. Police are stating they have no information that a rocket strike location has been identified. 2:03 PM The funeral for the boy killed in today's terror attack in Bat Ayin will take place at 5:00 PM at Bat Ayin. 2:00 PM Reports that the axe terrorist was apprehended. The alleged terrorist was stripped and interrogated, and it is now clear the terrorist is still at large. IDF confirms they have not yet captured the axe terrorist. 1:54 PM At 1:15 PM today air raid sirens went off in Northern Israel, specifically in the Nahariya, Shlomi, and Maalot area. 1:44 PM The 7 year old is now classified as being in moderate condition. Terrorist still at large, Gush Etzion communities still on alert. JoeSettler called up as part of his community's counter terror unit. 12:56 PM The community of Bat Ayin is requesting prayers on behalf of the very seriously wounded 7 year old, Shlomo ben Revital Yair ben Michal. 12:42 PM NRG reports that it was a 16 year old killed in the attack, and the 7 year old is in very serious condition with a head wound. The terrorist is still at large, manhunt continuing. 12:39 PM Reports that the victims of the terror attack are residents of the Bat Ayin community in Gush Etzion. 12:37 PM IDF Army radio (Galei Tzahal) reports that both the seriously wounded 7 year old and and murdered child/teenager were both attacked by the axe wielding terrorist. Ongoing manhunt for the terrorist. 12:35 PM Update: One child/teenager has been killed, the 7 year old is in serious condition. 12:33 PM Channel 2 reports that 2-3 people are wounded in the attack. An IDF helicopter is now searching the area for the fleeing terrorist. 12:31 PM Unconfirmed reports that the child attacked, has died. 12:28 PM Reports that the terrorist has escaped and is fleeing the community towards the Arab village of Tzurif. Large IDF and Police manhunt underway. 12:24 PM MDA reports 7 year old in very serious condition with head wound from an axe. Gunfire towards Palestinian terrorist. Unsure if the second wounded is the terrorist or someone else. 12:20 PM Reports of a 7-year old in serious condition after being wounded by Palestinian terrorist's axe in Bat Ayin attack. Child en-route to Jerusalem hospital. 12:17 PM Reports of 2 wounded, a child and adult, from shooting and from use of an axe by the terrorist. 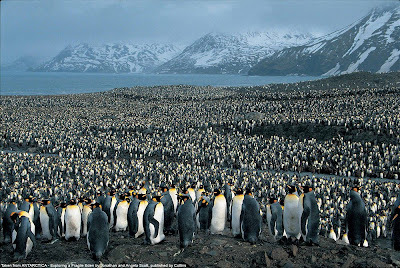 Large forces converging on location. 12:15 PM Report of Palestinian terrorist shooting attack within the Bat Ayin community in Gush Etzion. The move, described as "epochal" by media commentators, will see all Guardian content tailored to fit the format of Twitter's brief text messages, known as "tweets", which are limited to 140 characters each. Boosted by the involvement of celebrity "twitterers", such as Madonna, Britney Spears and Stephen Fry, Twitter's profile has surged in recent months, attracting more than 5m users who send, read and reply to tweets via the web or their mobile phones. As a Twitter-only publication, the Guardian will be able to harness the unprecedented newsgathering power of the service, demonstrated recently when a passenger on a plane that crashed outside Denver was able to send real-time updates on the story as it developed, as did those witnessing an emergency landing on New York's Hudson River. It has also radically democratised news publishing, enabling anyone with an internet connection to tell the world when they are feeling sad, or thinking about having a cup of tea. "[Celebrated Guardian editor] CP Scott would have warmly endorsed this - his well-known observation 'Comment is free but facts are sacred' is only 36 characters long," a spokesman said in a tweet that was itself only 135 characters long. For example, Martin Luther King's legendary 1963 speech on the steps of the Lincoln memorial appears in the Guardian's Twitterised archive as "I have a dream that my four little children will one day live in a nation where they will not be judged by the colour of their skin but by", eliminating the waffle and bluster of the original. At a time of unprecedented challenge for all print media, many publications have rushed to embrace social networking technologies. Most now offer Twitter feeds of major breaking news headlines, while the Daily Mail recently pioneered an iPhone application providing users with a one-click facility for reporting suspicious behaviour by migrants or gays. "In the new media environment, readers want short and punchy coverage, while the interactive possibilities of Twitter promise to transform th," the online media guru Jeff Jarvis said in a tweet yesterday, before reaching his 140-character limit, which includes spaces. According to subsequent reports, he is thinking about going to the theatre tonight, but it is raining :(. A unique collaboration between The Guardian and Twitter will also see the launch of Gutter, an experimental service designed to filter noteworthy liberal opinion from the cacophony of Twitter updates. Gutter members will be able to use the service to comment on liberal blogs around the web via a new tool, specially developed with the blogging platform WordPress, entitled GutterPress. According to unconfirmed rumours, Jim Buckmaster, the chief executive of Craigslist, will next month announce plans for a new system of telepathy-based social networking that is expected to render Twitter obsolete within weeks. Listening 2 new band "The Beatles"